Deadbolt is known in the Manchester scene as the night to go for a move away from the traditional clubbing experience. The club night incorporates elements of interactive games, live music performances and giveaways throughout the night to create a house party atmosphere with a hint of mayhem. During its five years, Deadbolt has seen guest appearances from Funeral for a Friend, DJs from Slam Dunk (Leeds), Benji Webbe (Skindred) and Tek-One. The audience have received giveaways from brands such as Live Without Regret, Studio IX, Skull and Bones Boys Club, Forbidden Planet and Vans Clothing. 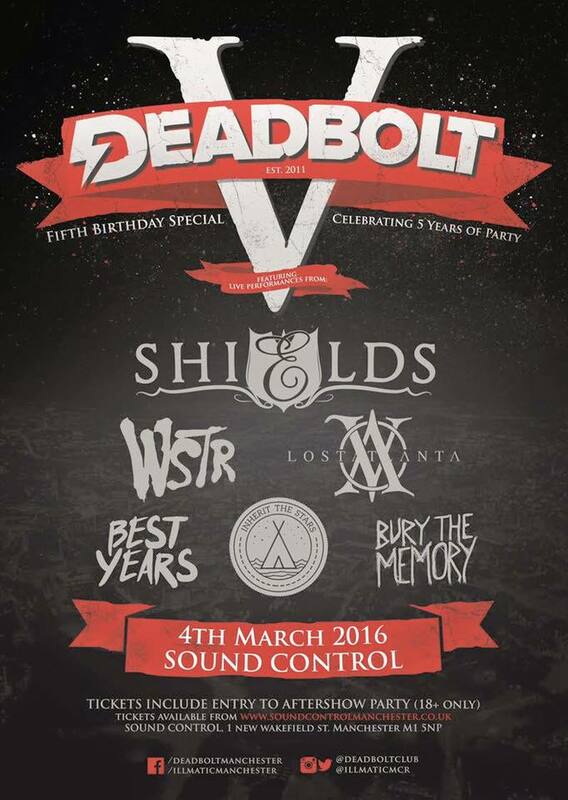 In 2014, the first annual Deadbolt Festival took place with headliners Astroid Boys and Ingested. Following its success, the festival returned last year with headliners Heart of a Coward and Napoleon and an after party with guest DJs from night all across the UK such as Newcastle’s Alpha, London’s Trauma (from the Facedown family), Bristol’s Fat Lip and Manchester’s Dog House. As is tradition for Deadbolt, the birthday will be celebrated with live performances followed by a club night filled with guests, games and giveaways. The live gig portion of the birthday celebrations will see from performances from Shields, WSTR, Lost Atlanta, Inherit the Stars, Best Years and Bury the Memory. Off the Rails magazine will host the after party with a lineup of models, giveaways and their own unique brand of party games. Thunder Apparel will deliver giveaways to the crowd, including limited edition Deadbolt fifth birthday t-shirts. Following their album release gig, Yashin will make their way to Deadbolt for their official afterparty where their vocalist, Harry Radford, will entertain the crowd with a guest DJ set. 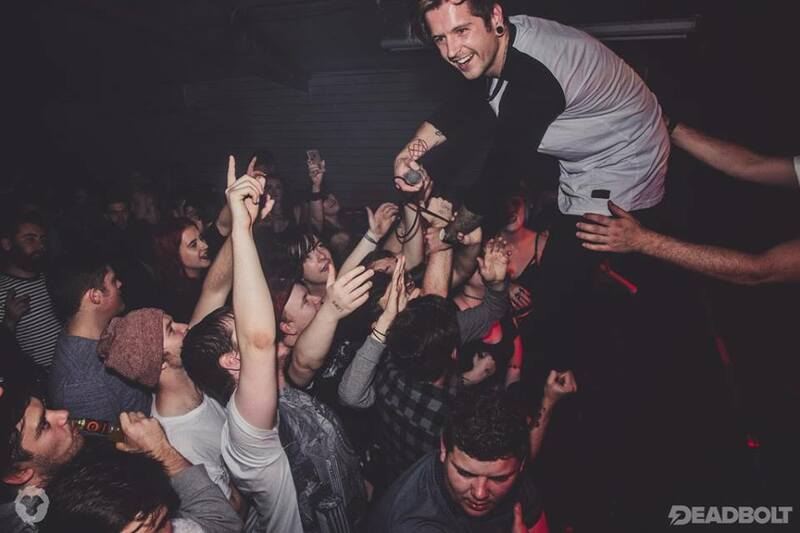 Another guest DJ set will be played by UK metalcore royalty Bury Tomorrow. iLLmatic, the sister brand of Deadbolt, will take over the middle floor of Sound Control with Hip Hop, RnB and Party Anthems and its own lineup of guest DJs from Manchester’s fantastic pool of DJ talent. Pitch from the critically acclaimed Mouse Outfit, Manchester’s Hip Hop band and production outfit, will make an appearance for a guest DJ set. Drum and Bass Brands Grand Theft Audio and Manchester Sub Club will compete in a high energy DJ battle. Manchester HipHop brand Taste the Diff’rence will host a rap battle to entertain and engage the crowd. We don’t plan to slow down and we hope to become even bigger and better as we move into our fifth year. Tickets for this event are available via Skiddle, Fatsoma and the Sound Control website. To find out more, visit the Deadbolt Facebook page below.